These sesame kale and beef rice bowls with fried eggs and pickled carrots make a quick and hearty gluten-free dinner with plenty of vibrant colors and rich flavors. I’m finally back with a new recipe! I’m currently typing this with one hand while Madeline is nursing. Having a baby is a lot of fun, but it doesn’t leave me with much extra time. Luckily Madeline is generally an easygoing baby who eats and sleeps well and doesn’t cry too much, so if I play my cards right I can still get a fair amount accomplished. It’s been wonderful having three uninterrupted months to focus on bonding with Madeline and Ben, but I’m very excited to get back to sharing recipes with you. 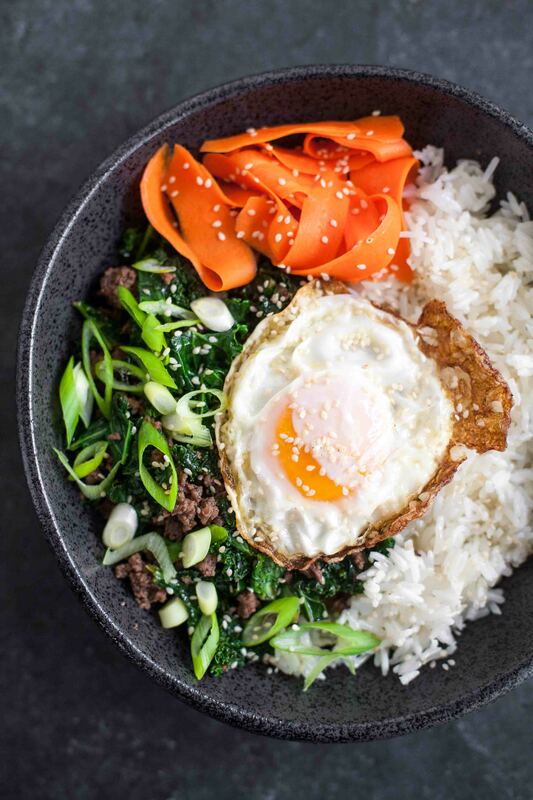 These sesame kale and beef rice bowls with fried eggs and pickled carrots may sound like a mouthful, but they’re easy to put together and just the kind of thing I want to be eating on a Monday night. 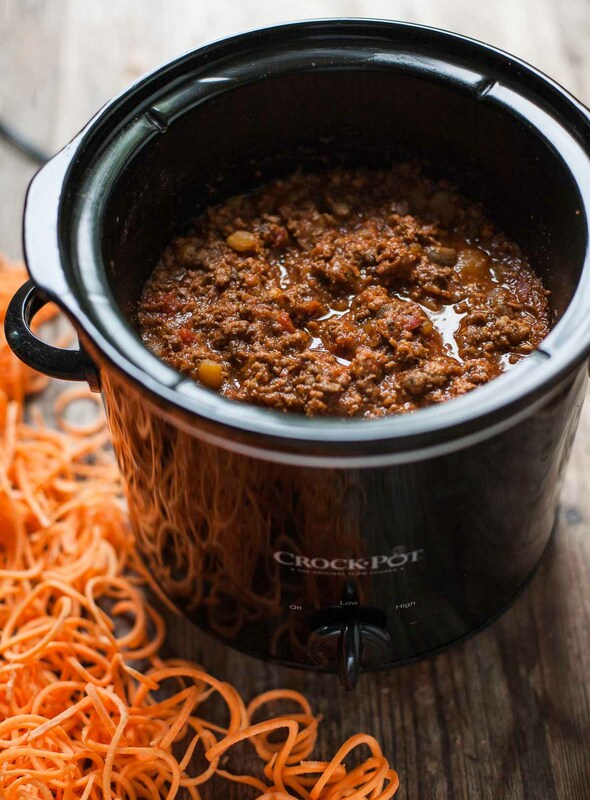 This paleo & Whole30-compliant Instant Pot bacon and sweet potato chili is an old favorite made twice as fast in the pressure cooker. Make a big batch and freeze some for later! I’m kind of a chili purist. I don’t like beans in my chili and I don’t want any tomatoes in there, either. I also don’t like it to be too soupy. Over the years I’ve tried many chili recipes, but my bacon and sweet potato chili is the only one I come back to again and again. Many of my friend have made it, too, and it’s always a hit. It freezes really well, so it’s a perfect make-ahead meal. I’m definitely planning to stock my freezer with some to have on hand once our baby arrives! This post is sponsored by Uncle Steve’s Italian Specialties. 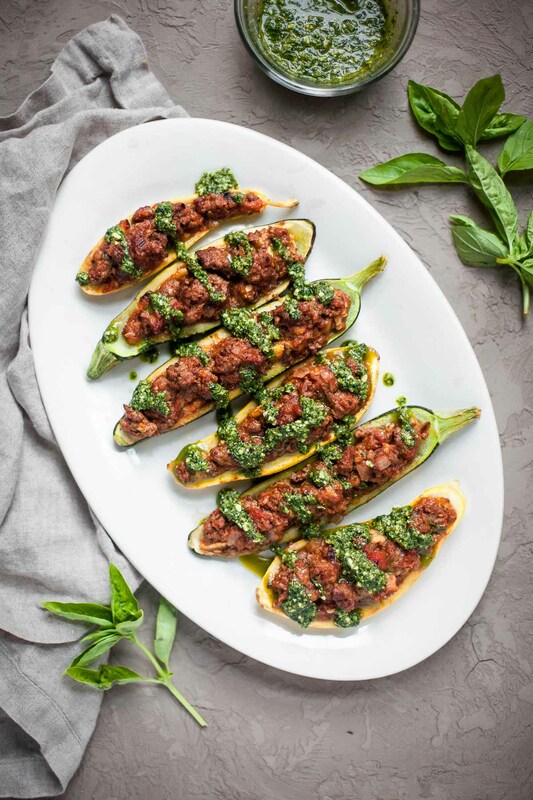 These bolognese stuffed zucchini with pesto are a satisfying and summery Whole30 meal made with organic tomato basil sauce, ground beef, and plenty of fresh pesto on top. How is summer treating you so far? Here in Chattanooga it’s been nice and hot (just the way I like it!) and we’ve been getting in a lot of swimming. I’ve also been working on my tan while doing my farm share work, and loving the first rounds of summer produce showing up, like zucchini, basil, and even a few tomatoes. I used my early squash to make these bolognese stuffed zucchini with pesto, which combine seasonal vegetables and a few pantry staples to make an easy but hearty paleo dinner. And no, I’m not suggesting you make a true bolognese sauce that needs to simmer away for hours in this heat. This is a bit of a cheater’s bolognese, because we’re letting Uncle Steve’s do the hard work for us. 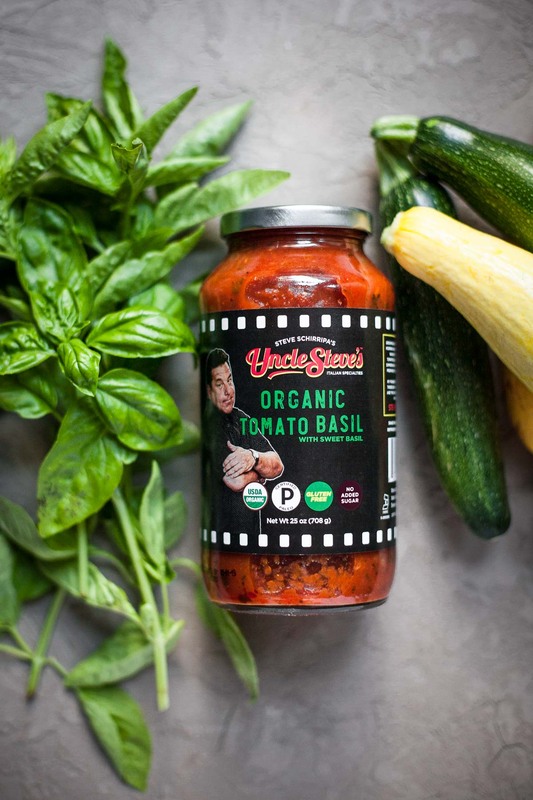 Their organic tomato basil sauce is so flavorful that all we have to do is brown the ground beef with a little onion, and stir in the sauce. The resulting filling will fool all your lucky dinner companions into thinking you worked all day to handcraft an authentic Italian sauce. 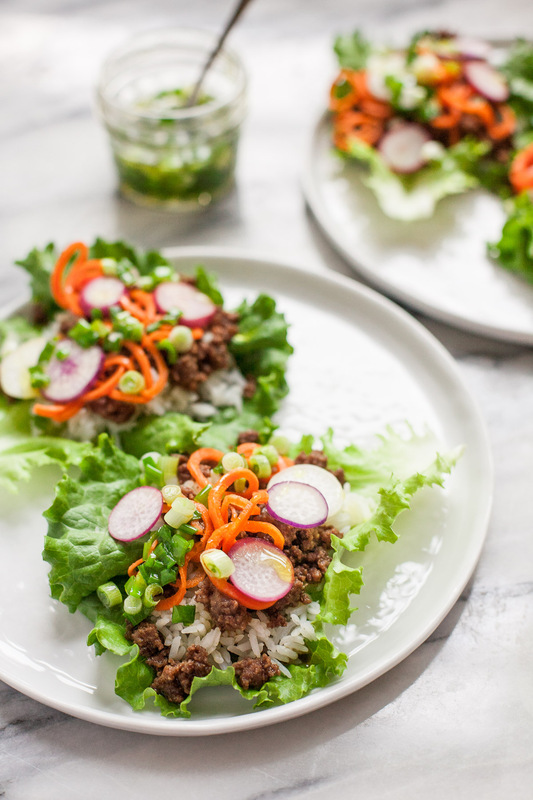 These quick Vietnamese beef lettuce wraps are my new go-to light dinner for spring. They’re gluten free, dairy free, paleo friendly, and easy to put together. I am a huge fan of Vietnamese food. When Ben and I lived in Boston, our neighborhood had a lot of Vietnamese families and businesses. There was a great little supermarket within walking distance where I could pick up everything from fish sauce to rice paper wraps to long stalks of fresh lemongrass. One of our favorite restaurants, Pho Hoa, was just blocks away. I usually ordered the house special vermicelli plate. It had pretty much everything: grilled pork, shrimp on sugarcane, meatballs, grilled scallions, pickled carrots, chopped peanuts, and even a sliced spring roll all on top of vermicelli. It also came with rice paper wraps and a bowl of hot water so you could make your own fresh rolls. 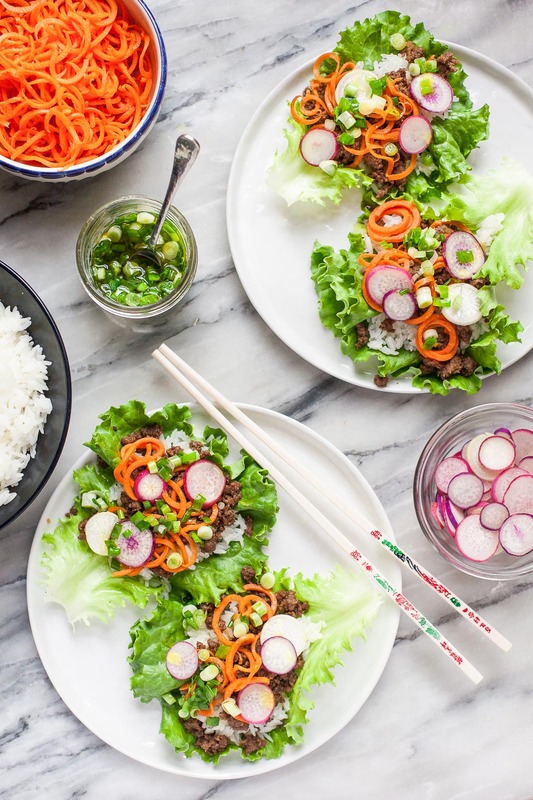 These fast and easy Vietnamese lettuce wraps are loosely based on the flavors of that dish. Instead of vermicelli and rice paper wraps, we’re using fresh leaves of lettuce with a little jasmine rice inside to soak up the saucy beef. You could definitely use rice noodles or cauliflower rice instead if you prefer! The beef is quickly cooked with a little garlic and a sauce that combines tamari (or coconut aminos), fish sauce, honey, and sambal oelek. The result is an umami-packed flavor with just the right balance of sweet, salt, spice, and funk. 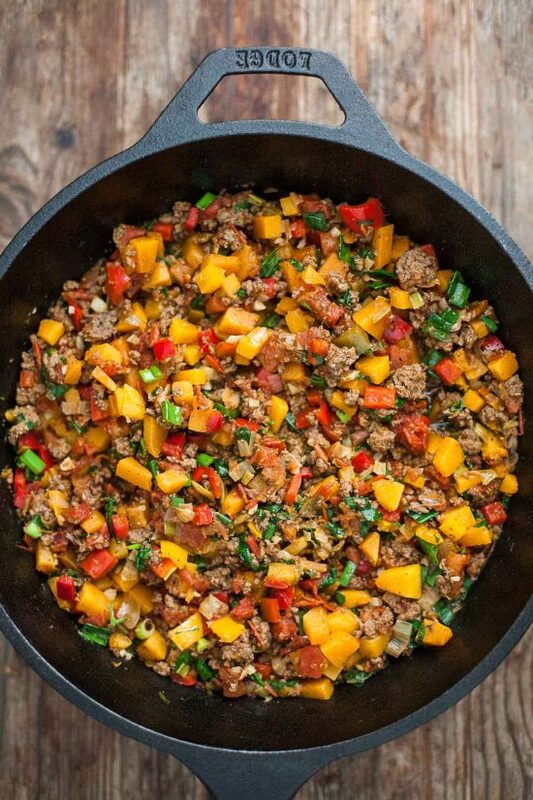 This paleo tamale pie combines a beef chili base made with peppers, tomatoes, and squash with a fluffy, grain-free “cornbread” topping. 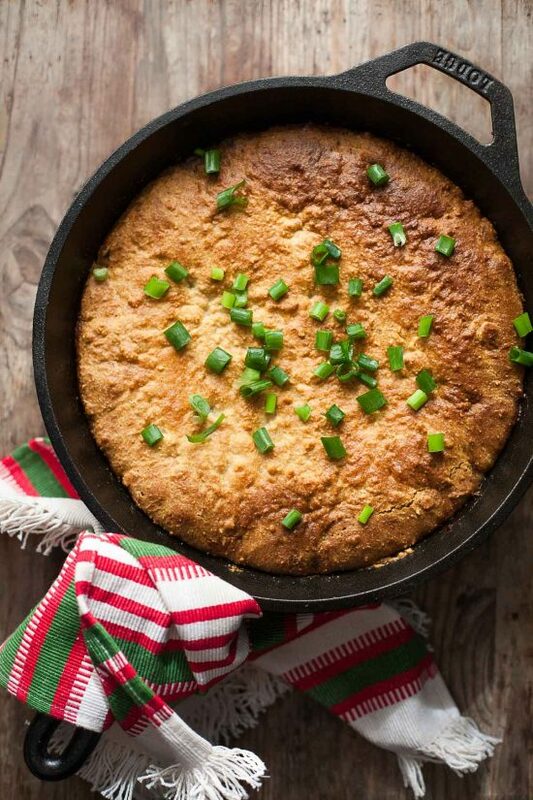 Have you heard of tamale pie? It’s a casserole that’s loosely based on the ingredients for tamales, except they’re layered in a dish or skillet instead of wrapped in corn husks. Think a really delicious beef chili with a layer of cornbread baked right on top. I didn’t grow up eating tamale pie, but apparently a lot of people did–a Bon Appétit article caught my eye recently with the headline: “Cornbread Tamale Pie Is the Greatest Recipe of All Time.” The author made a great case for why this dish is one of the best foods ever, and I was left with a distinct hankering to create a paleo tamale pie of my own. For the filling, I packed in as much delicious produce as humanly possible: diced scallions, garlic, tomatoes, bell peppers, butternut squash, and cilantro. No, butternut squash is not a traditional ingredient in tamale pie, but I had half of one in the fridge just begging to be thrown in. I ended up loving the subtle sweetness the squash added. Conventional tamale pies often have corn kernels in the filling, so the butternut makes up for that by lending sweet pops of flavor without the addition of grains. When you make this, you may find yourself tempted, like I was, to just eat the chili base on its own and to forget about the faux cornbread topping. I actually spooned myself out a little bowl of filling to eat while the tamale pie baked, and I suggest you do the same: I don’t want you to miss out on the fluffy topping, but the chili is great in its own right, so why not sneak in a little mid-cookup snack? This Cuban picadillo with plantains is a quick and tasty Whole30 meal that covers all the flavor bases: sweet, savory, tangy, spicy, and creamy. Big news! The third book in Melissa Joulwan’s best-selling Well Fed series is almost here, and in my opinion, it’s the best one yet. Well Fed Weeknights is packed full of creative and delicious dinner recipes that can all be made in 45 minutes or less. I’ve been a fan of Mel’s scrumptious recipes ever since I first made her carnitas years ago, so I was super excited when I got my hands on a preview copy of the book. Since I love Cuban food and especially adore plantains, this picadillo with plantains called out to me right away. Picadillo is sort of like a hash made with ground beef and various other additions depending on the country each version hails from. This Cuban one starts off with onion, garlic, and a fragrant mix of spices starring cumin, coriander, and cinnamon, and is finished off with chunks of green plantain, sweet raisins, and green olives. 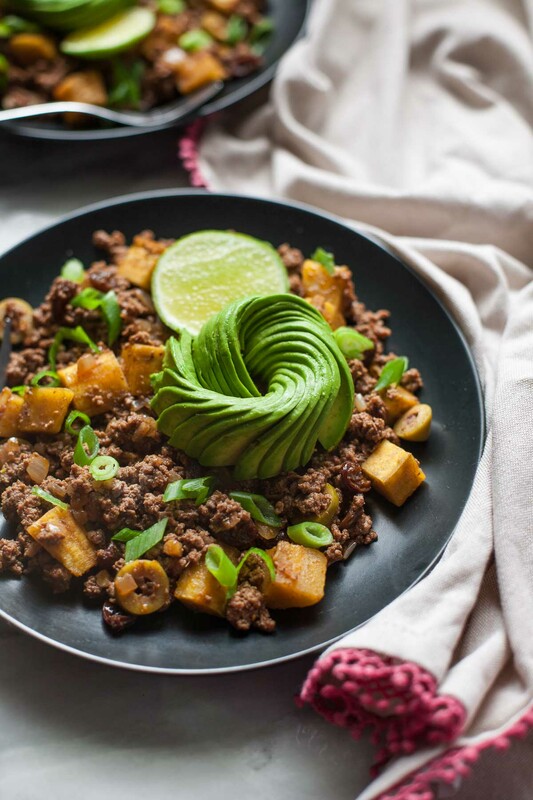 The picadillo is then served with lime slices, scallions, cilantro, and–if you’re me and you like to try out food trends but usually do so several months late–avocado roses. 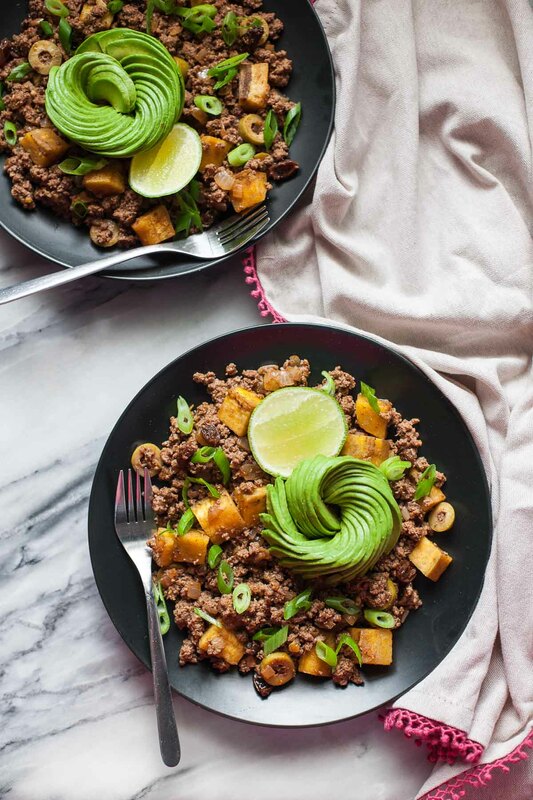 The result is a dish that’s satisfying and interesting in the best way, with sweet pops of raisin, sour olives, perfectly spiced meat, chewy plantains, and creamy avocado coming together to make quite a flavor party. 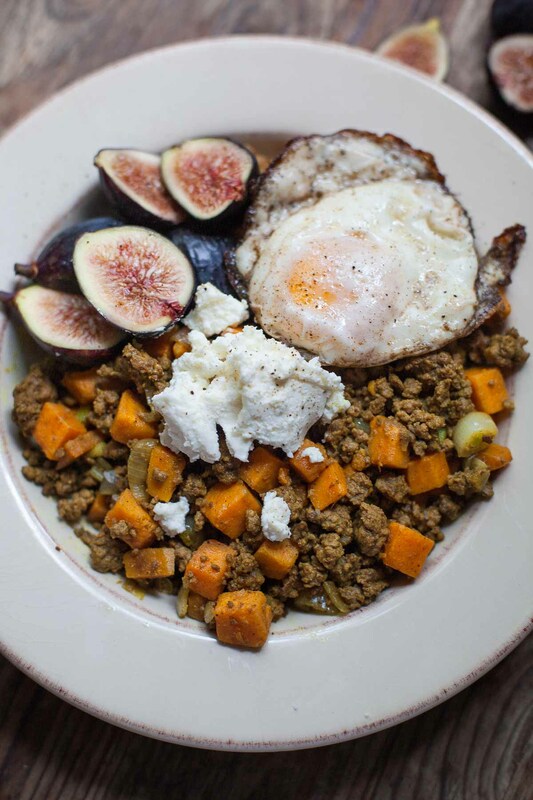 Spiced beef and sweet potato bowls with crispy eggs, fresh figs, and goat cheese: a unique and satisfying grain-free breakfast or dinner in less than 30 minutes. This may seem like a strange combination of foods, but don’t knock it ’til you’ve tried it. This quick spiced beef with sweet potatoes is delicious all on its own, but adding a crispy egg, a few fresh figs, and a generous dollop of goat cheese kicks things up several levels. The spiced beef and sweet potatoes is a fast, pared-down version of my bacon and sweet potato chili, with a few slightly more exotic spices added in. Microwaving the sweet potato chunks for a few minutes while the meat is browning saves times and ensures even cooking. Coriander, turmeric, cardamom, and allspice give the beef and sweet potatoes just the right amount of fragrance and spice. In case you haven’t had the pleasure of indulging in a crispy egg, let me sell you on it. It has perfectly cooked whites, a runny yolk, and irresistible crunchy browned lacy bits all around the edges. 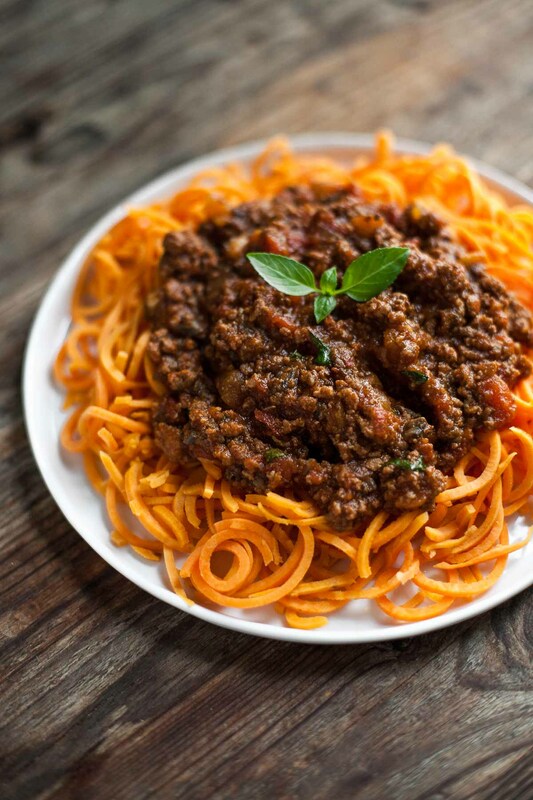 There’s nothing more comforting than a slow-cooked Bolognese sauce with sweet potato spaghetti! It’s gluten free, paleo, and much more colorful and nutritious than regular spaghetti and meatballs. This is Whole30 comfort food at its best. Making Bolognese sauce every Friday is a new tradition of mine, and even though I’ve only been doing it for a few weeks, it’s already made my weekends much heartier and more delicious. I have Fridays off this semester so I can stay home while this fragrant sauce simmers away, but if you have to work you could start the sauce in the morning before you leave and finish it in the slow cooker, or make it your Saturday or Sunday tradition instead. You want to let this sauce cook for a nice long time because the flavors will continue to meld and develop over the course of several hours. The long cooking time is the reason bolognese sauce is so synergistic. I also think the sauce tastes even better when I reheat it a day or two later, but I can never resist eating at least some of it the day I make it. The aroma is so enticing! Because everyone’s schedule is different, I’m providing a slow cooker version and a version that cooks completely on the stovetop. Other than the cooking time, which is much longer for the slow cooker version, the only difference is the amount of liquid you add. The stovetop version needs extra liquid since much of the water in the sauce will evaporate, but the slow cooker keeps all that moisture locked in. I’ve been on the fence for a while about whether I should buy a spiralizer . I want to make rutabaga noodles so badly, but I can’t seem to bring myself to purchase another kitchen gadget. I’ve made zoodles by hand with my julienne peeler, but it’s a huge pain. After adding the spiralizer to my cart on Amazon several times and then taking it back out again, I’ve decided that I’m going to ask for one for my birthday next month (are you reading this, Mom?). I won’t feel as bad about getting yet another cooking tool if it is a gift from my wonderful mother. 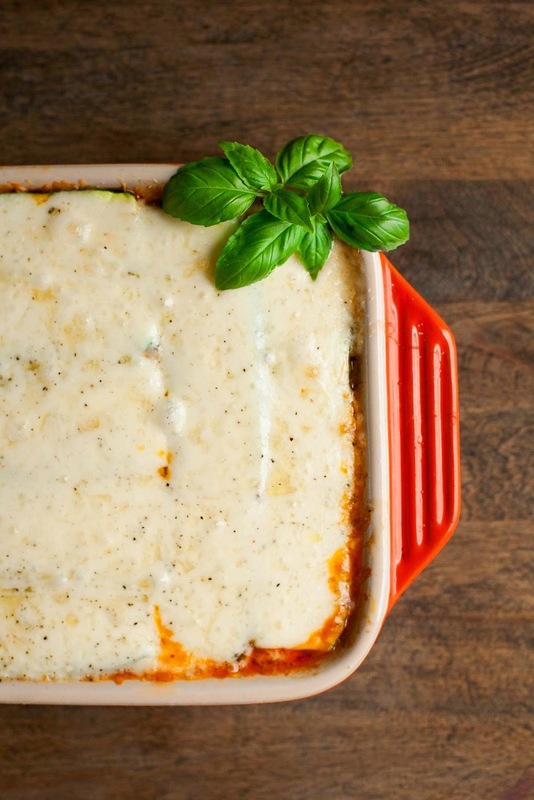 In the meantime, I was excited to find this zucchini lasagna over on Sarah and Tim’s blog, Curious Cuisiniere, because it uses veggie noodles that you don’t need any special gadgets to make. Strips of zucchini stand in for lasagna noodles, but all the great Italian flavors and delicious textures of the original dish still come through. Curious Cuisiniere was my assignment for this month’s Secret Recipe Club reveal, and I had a great time perusing the site to choose a dish. 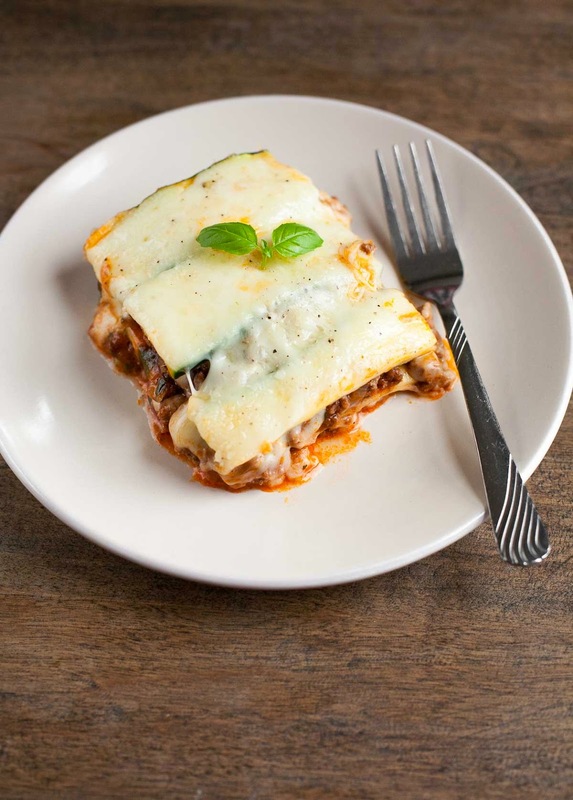 I noticed that this recipe isn’t their only noodle-free lasagna–they also have a butternut squash lasagna that I’m planning to try in the fall. Sarah and Tim also have recipes from countries all around the world, and the best part is that they have an interactive map that helps you explore food from different regions. Click on India, for example, and you’ll be taken to a page with all of the Indian recipes on Curious Cuisiniere. So cool! If you’re looking to expand your palate and cooking repertoire with some food from faraway lands, their blog is the place to do it. 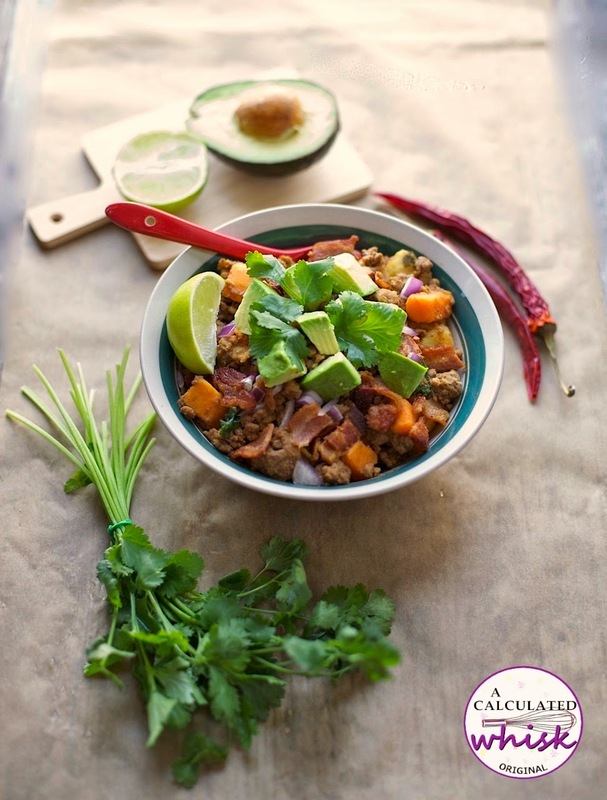 This bacon and sweet potato chili is my go-to paleo dinner. The recipe makes a large batch, and it freezes well! Do you have a really big skillet? If not, you are going to want to go buy one so you can make this bacon & sweet potato chili right away. If you are not convinced that you need a 14-inch skillet, I understand. However, I intend to convince you to make this chili. 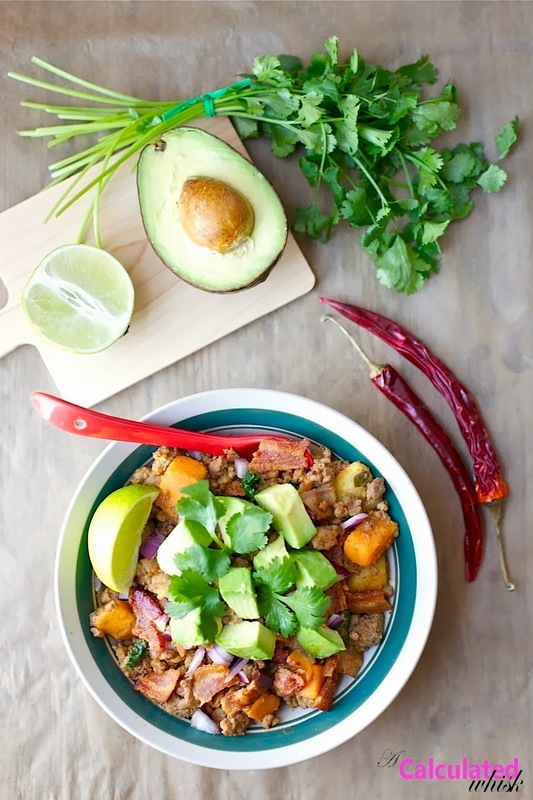 It’s the best chili I’ve ever had, and it’s a complete and colorful one-pot meal. If you didn’t just go buy a huge skillet and/or don’t need to feed a bunch of people, you can halve the recipe and make it in a normal-sized pan. Why is this the best chili ever? Well, because bacon. And sweet potatoes. And all the fresh things on top that make this the perfect comfort food to carry you from winter into spring. This dish is for people like me, who don’t want beans or any tomato products or a lot of excess liquid in their chili. I just need salty bacon, sweet potatoes, some perfectly spiced meat, and what’s basically deconstructed guacamole for a topping. Using half pork and half beef gives the chili even better flavor. It’s amazing right away and it’s even more amazing the next day. My mother agreed that this is the best chili ever, and she is kind of hard to please. I haven’t heard her rave so much about a food I’ve made since this cranberry orange curd tart. There is kale in this recipe. If you don’t want to put kale in your chili you obviously don’t have to, but I want to tell you that you can barely taste it. It’s just a nice way to sneak in some greens and start feeling a little more springy. I got the idea to put kale in chili from the cookbook Cooking with Coconut Oil, and now I’m hooked. It adds great color and texture, and makes me feel extra healthy when I eat it. 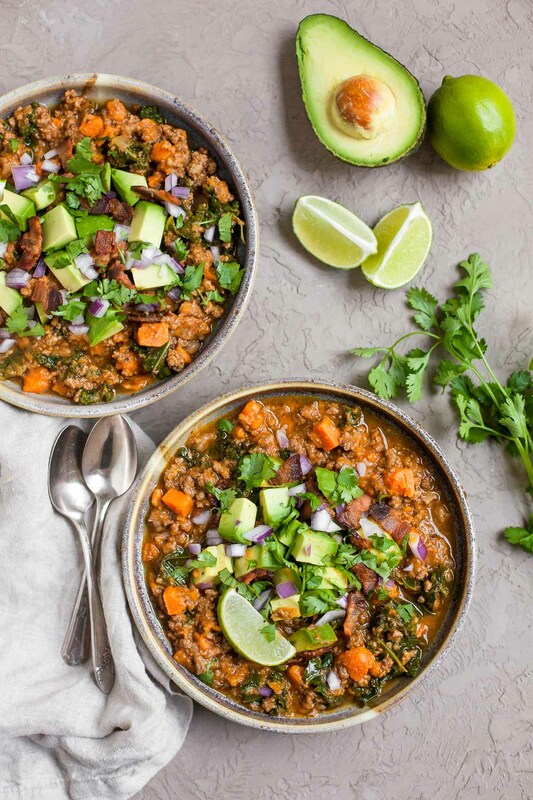 One more reason to make this bacon and sweet potato chili, and to put kale in it? Kale & sweet potato are really good friends. See proof here. 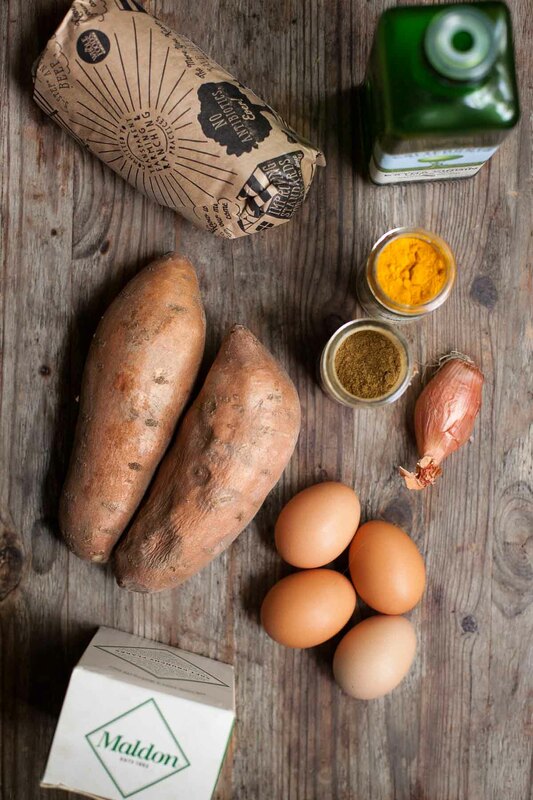 Rutabaga is even more delicious than potato atop this paleo version of shepherd’s pie. This shepherd’s pie with rutabaga is one of my go-to dinners during the colder months! In my opinion, potatoes are very overrated. They don’t really taste that great unless they’re fried or covered in cheese, which is cheating. A great vegetable should taste delicious with less than that. Enter the rutabaga. You may have seen rutabagas hiding at the grocery store under the name “yellow turnips”. Although they’re yellowish on the inside, on the outside they fade from white to light purple. They’re much lower in calories and carbohydrates than potatoes, and also taste way better. I would choose mashed rutabaga over mashed potatoes any day, and their lovely yellow color makes this shepherd’s pie look even more inviting than the traditional version.